There’s a foot of snow outside, which is a telling sign that our landscaping season is over. Earlier this year, we sent a photographer out to various yards that we’ve either installed or worked on in recent years. Below are a few of our favourite photographs. This is truly a one-of-a-kind front yard for our typically conservative minded city. All the grass is gone, and in are perennials gardens, shrubs, brick walkways, brick steps and a big patio. We tried to pick plants that look great for long stretches of the summer to reduce garden work (dead heading) and the density of the plantings almost entirely eliminates weeds (no exposed soil). 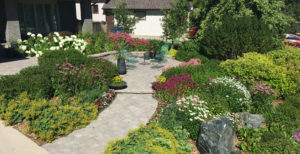 Roman paver walkways and patios dissect the gardens, providing different perspectives and close-ups of the various flowers. Here’s a perfect example of how landscaping can truly take the appearance of your home to the next level. The scale and design of the landscape plan is in perfect harmony with this Tuxedo home. 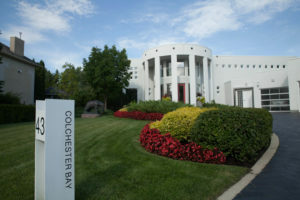 Our team is consistently involved with this property, summer after summer, working in the gardens, adding plants, and of course, planting annuals. The red begonias, flowering all throughout the property, add some serious punch. This Lindenwoods front yard was landscaped a few years ago, and the shrubs and perennials are now starting to mature. A winding paving stone path takes you up to the front door, flanked by large, curvy gardens reaching out in both directions. Brick retaining walls from Barkman create some depth by adding a second level to the plantings. We’ve also capped the front steps with Roman pavers, which is a very economical way to refurbish your old, discoloured concrete entrance. Here’s a new wood deck with a bit of flare. This isn’t your typical back yard deck. Everything is built on a 45 degree angle from the house, creating a very visually interesting space. Different levels are sized and shaped to fit the individual sitting areas (one dining and one lounging) and the terracing style eliminates the need for stairs and railing. At the door, a pergola with brick cladding frames an outdoor kitchen with brick facing, marble countertops and built in appliances. A thoughtful landscape design makes a big difference. 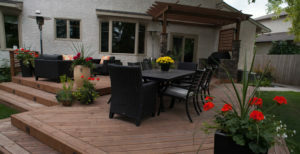 Nothing is over the top or high end in this St. Vital back yard, but a couple different sitting spaces are arranged very harmoniously, making for a very cozy back yard retreat. A wood pergola sits above a outdoor dining space on the pressure-treated deck, while one step below is a paving stone patio with a second sitting area. Surround gardens and prairie grasses soften the background and hides the property boundary and fence. How about something a little more contemporary. This yard features travertine slabs from barkman. A lower patio below the deck makes space for some chaise loungers, while the same slabs are cut into the lawn as stepping stones, parallel to the house. The same travertine tiles are cut in half and are used as lawn edging, for a more permanent look in place of typical black poly garden edging. Our galleries have now been updated with some new pictures from this season. Have a look here.